Ali was spending last weekend in London at a James Bond exhibition with her boyfriend. She said to me she wanted 'James Bond but not James Bond' which is a fabulously difficult thing to achieve so I suggested we go for the vague theme by just using the gold and black theme. The colours I used were Shellac Sugared Spice with Tinsel Toast on top on all fingers apart from her ring fingers. Black Pool is on her ring fingers and as Ali's nails are typically teeny tiny, she went for a basic wave print on her in gold polish. I used a Cheeky Jumbo Plate for it and I love the effect it gives. 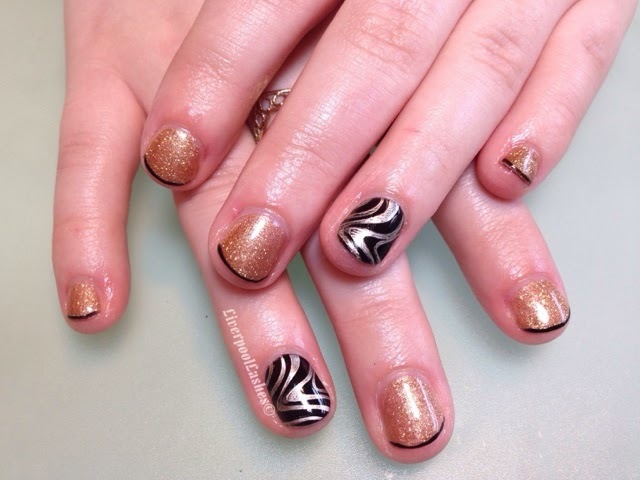 I also added Black Pool to the tips of each gold nail in a french polish style. I kept it super thin so that it didn't take over the gold. Whenever I use an image plate it reignites my fire for them. They're just so precise and quick to do, particularly when you're doing a full set of the print or something.